A research project which will offer free access to a world-leading network of testing and research infrastructures – including the University of Plymouth’s COAST (Coastal, Ocean And Sediment Transport) laboratory – is now open for applications. MaRINET2 is a €10.5million project funded by the European Commission’s Horizon 2020 programme, and coordinated by the MaREI (Marine and Renewable Energy Ireland) Centre. The project will accelerate the development of offshore renewable energy technologies by providing free-of-charge access to a network of 57 research facilities across Europe. Access will be granted through a series of competitive calls for applicants, and the first call is now open to offshore energy technology developers, including wind, wave and tidal energy at system and component level. It will close on 20 May 2017. 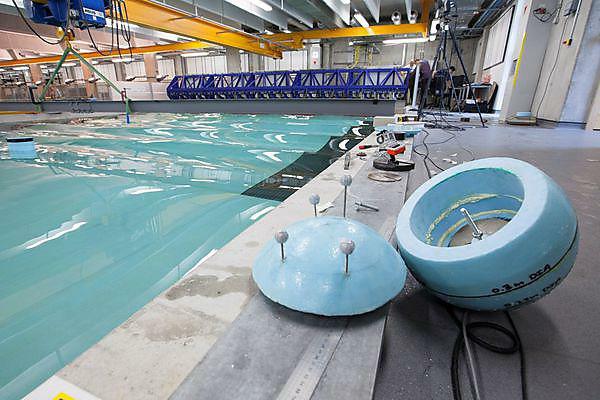 Housed within the Marine Building at the University of Plymouth, the COAST laboratory provides physical model testing with combined waves, currents and wind, offered at scales appropriate for device testing, array testing, environmental modelling and coastal engineering. It is a flexible facility with the capability to generate short and long-crested waves in combination with currents at any relative direction, sediment dynamics, tidal effects and wind. “Over the next four years, MaRINET2 will be an important instrument in reducing the cost of development in Europe’s offshore renewable energy sector. It will keep innovative new technologies progressing towards the marketplace, and keep Europe at the cutting edge of development globally. It will also strengthen Europe’s network of world-leading offshore renewables research infrastructure." “Access to testing and research infrastructures within MaRINET2 will open collaboration opportunities among different actors in the sector. This is a positive development."